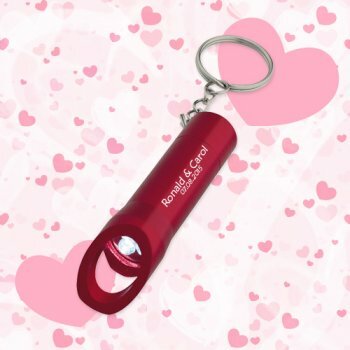 Personalized flashlight keychains w/bottle opener wedding favors-red is perfect to light up your wedding celebrations. This wedding gift will not only keep reminding people about your great day, but also serve as a hanger for their keys and light up their pathways. With its brilliant metallic finish, you can expect people to grab it happily. 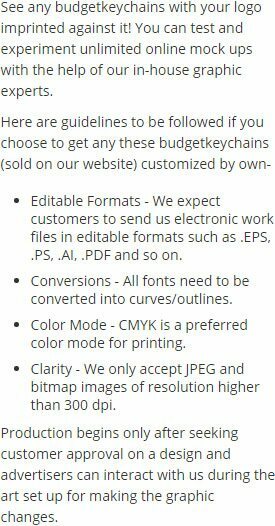 You can gift it individually or as a tote bag insert. It is available in multiple colors with button cell batteries included. Users need to push button to turn on/off light as per their requirement. 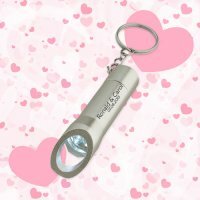 Request a quote to know bulk order discounts for these custom wedding favors flashlight keychains w/bottle opener-red. Features –Includes button cell batteries, bottle opener and strong key ring. 3 white LED lights. Metallic red aluminum body. Imprint area - 1" W x ?" H.
Imprint colors – Laser Engraves White. For Black Oxidation Add .55(G) Per Piece.